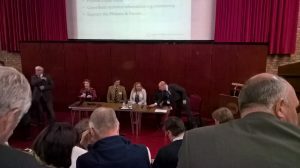 Conservation Officers Cathy Horsley and Daisy Headley attended the second Farmer Cluster conference, which was held in Birmingham and attended by 250 farmers, advisors, and representatives from the conservation sector. Farmer Clusters are groups of neighbouring farmers working together to encourage wildlife on their farms, helping to join up habitats across the landscape. The ideas are farmer-led, and are co-ordinated by a facilitator. There are now 100 Farmer Clusters in England, and are aided by Natural England’s Facilitation Fund. Mark Stevenson (Defra) opened the conference by summarising Defra’s 25 year Environment Plan goals and ambitions for nature. This includes clean air and water, thriving plants and animals, and using resources more sustainably. One approach for its delivery is using Nature Recovery Networks (NRNs), and West Country Buzz is one of the projects piloting this idea. NRNs involve working at a landscape scale to create and connect up sites for wildlife in a targeted way. Following talks covered the importance of monitoring wildlife in Farmer Cluster areas and ways of going about it, to measure how successful management is. Farmer Sam Topham and facilitator Sarah Brockless (Oakbank) gave a thoughtful account of how farmer clusters work in practice. The farmers’ enthusiasm for seeing wildlife recover and their love of the land was obvious. New friendships have formed, more people have entered into Countryside Stewardship, and resources such as equipment have been shared between members, all as a direct result of the Farmer Cluster. On the flip side, some of the challenges were delayed payments; and that regular one-to-one support, rather than group support, from the advisor is essential. The afternoon session included a talk by Cathy from the West Country Buzz project. 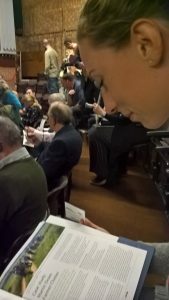 Cathy explained how landowners, farmers and volunteers are working in North Devon to create and join up habitat for rare bumblebees and other pollinators. The habitat is currently very fragmented, and late season forage is especially lacking. Ideas for how this could be reversed, such as through rotational grazing to allow diverse grasslands an opportunity to reach flowering, were presented. Some clear messages from the discussion sessions and the talks were the importance of continued one-to-one support for farmers and landowners, the importance of wildlife for sustainable farming, and the success of farmer-led approaches. To find out more about the conference and Farmer Clusters, click here.